When I read the introduction to Phil Barker’s latest set of rules “Damn Battleships Again,” (or DBSA,) my little wargamer’s heart skipped a beat. Why? Because just like Mr. Barker I too have some 30 years old 1/1200 models ~ which have mostly been sitting under, rather than on, my wargames table for those years because I couldn’t find or write a decent set of rules. It seems that Mr. Barker and I have been seeking the same Holy Grail for the last three decades. The Grail is of course an accurate, fun, quick and simple set of rules ~ a very rare thing indeed, and something to treasure if you find it. With DBSA I think Mr. Barker has done a great job so far and almost has the chalice in his hands. Naval wargames have lots to commend them. They are easy to set up, all you need is a blue cloth and the ship models and away you go. Ship models are available in many scales, from 1:600 to 1:6000 with prices to match. Naval battles and the ships are well documented, so, if you like, scratch-building your own ships is easy. Depending on the scale you use it is perfectly possible to field whole fleets on a 1:1 scale, something that is rarely possible for the land wargamer. Campaigns are also easy. So, if you are interested in wargames, ships and the sea there are lots of opportunities. The “Pre-Dreadnought” period has a special charm because of the odd ball nature of the ships concerned. In the Ancient period there is not much difference between a Greek trireme and a Persian trireme. The same is true for a French or British Napoleonic First Rate, or British or German World War One Dreadnought. This is because in these periods the dominant technology was settled and relatively perfected. Between 1860 and 1905 however the technological change was immense. 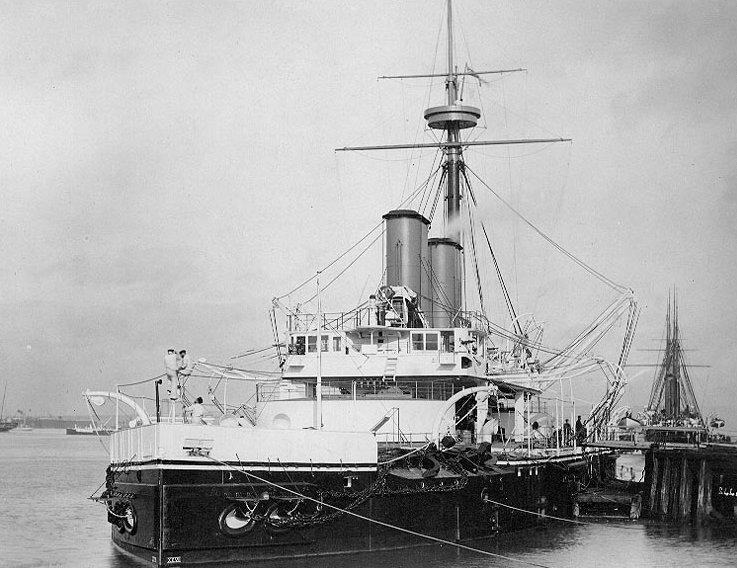 Warships developed from wooden vessels, relying on sails assisted by auxiliary steam engines for propulsion and equipped with smooth bore, muzzle loading guns, to armoured steel “dreadnoughts” with five times the tonnage, five times the speed, and breach loading rifled guns firing shells to 30 times the effective range as their predecessors of only 45 years before. During this period of great change ships were often obsolete soon after they were launched, and sometimes even before they hit the water. Applying the technology was also a conundrum. Guns could defeat the armour of ships, so was the answer to build ships with even more armour, or was armour pointless and should be left off altogether? Guns were usually inaccurate and slow firing so would other weapons like the new torpedo or even the ship itself using its ram be decisive? But even these imponderables were a moving target because of the pace of technological change. The penetration of a 12” gun increased threefold between 1870 and 1890 but likewise the change from iron, to compound (iron and steel,) to steel and later hardened steel armour increased the protection of ships fivefold. Rate of fire, especially for small and medium calibre weapons, increased dramatically in the 1890s but the range of the torpedoes carried on the torpedo boats that many of the quick firers were directed against increased form 400 yards to 4,000 yards in the period. Engines gradually became more efficient but, although sails could be dispensed with on coast defence and coast assault ships by the 1870s, a lack of overseas coaling stations led many powers to retain sails on their cruising ships until the end of the 1890s. The result of all this was a “fleet of samples” as designers of all nations tried to resolve the technological tactical and doctrinal issues of the day. 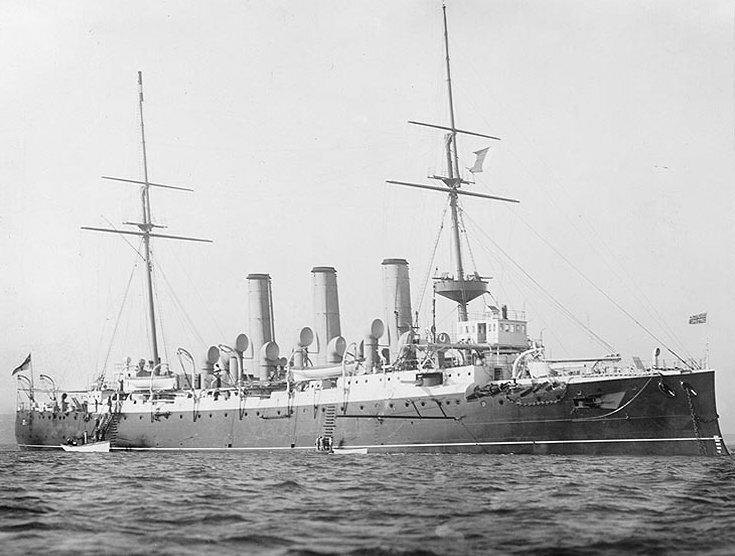 Thus, whilst in most other periods you have “classes” of several identical ships, for the pre-dreadnought period, especially before 1890, one or two offs were the normal production run of ships. Transfer this to the realm of wargames and you have ships that are fun to build and paint, because they are unique, and difficult to use together because of their disparate characteristics. And so to the rules. What has Mr. Barker done? As you can see here DBSA is still very much a work in progress but essentially he has applied the top down “DBX” approach to naval wargames, and it works. Command and control depends on the pip (or NIP) dice score, although everyone gets to move no matter how bad your dice, and the movement is simple with no rulers required. The combat system is both quick, and to my mind, accurate, using the familiar DBX system of a factor plus dice with different effects for a higher score or double. Range effects and armour penetration are covered by using different factors at different ranges. As is common with most of Mr. Barker’s rules he pays a lot of attention to time of day and weather conditions, both vital in naval games. Interestingly he is also working on the characteristics of the crews and commanders. Again I think this is vital. In naval periods where ships are very similar – such as the Ancients or Napoleonics we mentioned above – crew quality giving differences in manoeuvrability and fighting ability is the main factor in deciding defeat or victory, and thus a central part of the rules. However once you get to 1860 this disappears from practically all rules. I think that this is because most modern naval gamers are obsessed with accurately modelling the difference in stopping power between 11” and 12” armour, or the difference in penetration between a 45 calibre gun and a 50 calibre gun, but forget that battles like Lissa, Manila Bay, Santiago, Tsushima, Coronel and Sirte were decided by the quality of the crews more than by the qualities of the ships. Mr. Barker’s rules are still very tentative on this but I look forward to them taking shape. Unable to resist tinkering I humbly present some amendments to DBSA here. An appendix, containing the statistics of current list of ships from 10 or so navies can be found here. I’ve been in correspondence with Mr. Barker on my ideas, some he likes and has incorporated, most he doesn’t, but I don’t blame him. What he is trying to do is present a generic set of rules for the period 1890 to 1913 when the final form of pre-dreadnought ships was becoming standardised. I don’t have a problem with this and if I was starting to game in this period I would buy the fleets for Tsushima in 1:2400 or 1:6000 scale and use DBSA straight off. But my fleets started off with ships from 1860 to 1900 in 1:1200 and I wanted to use all of them, hence I use specific rather than generic values for the ships. On the rules themselves I’ve added to the system only in the use of torpedoes and ramming which I think DBSA does not reflect properly yet. Most of the rest of the nine pages consists of one-off rules that reflect the special characteristics of special ships. These are not vital to play but if I am going to all the trouble of scratch building on unusual ship I want its odd characteristics to be reflected as long as these don’t damage the flow of play. At the risk of flattering myself the amendments can be summed up by saying that Mr. Barker is developing a DBA for ships whilst I am (naively probably) aiming at DBM for ships! Finally, as I mentioned above, one attraction of naval games is the ease of campaigns. With no terrain to worry about movement is simple. Campaigns put table top games into a context that makes them more interesting than any “equal points” game. Obviously an umpire is the best way to sort out hidden movement but whilst I was surfing the web in search of pre-dreadnoughts I came across the “Aeronef” website which covers Victorian Science Fiction Airship combat of all things! Each to his own, though, because if they hadn’t used the names of British warships I would never have found them and I would have missed the little gem of a playing card based system that allows for hidden movement without an umpire. I’ve developed it specifically for DBSA here, but the basic concept is applicable to any wargames period, land or sea, so even if you are not into pre-dreadnought games it might be worth a read. Using this system four of us fought a Mediterranean-wide campaign involving 85 ships. Over 12 hours of play, (much of which was spent demolishing an exquisite side of beef roasted by Jeff,) we generated and fought to conclusion a cruiser stern chase and three fleet actions. We had a lot of fun but the important point is no other naval set of rules I know would have got us through four table games in 12 hours and still leave lots of time for map moving. The proof of the pudding, they say, is in the eating. My own opinion is that DBSA tastes very nice already and it can only get better. Jeff had never even played a post-ACW naval game before I introduced him to the first version of DBSA but he was instantly smitten. Since then he has built most of the Turkish, Greek and Italian navies! How about that for a ringing endorsement? So, if you have a fleet that has been neglected for 30 years; or you’ve always had an interest in pre-dreadnoughts but have never done anything about it; or you’ve never played a naval game before but are willing to try anything once; now is your time … try DBSA.